You can see the other tags created for Lisa here, on our DT blog. Now for BREAKING NEWS...Stores will get their newsletters TODAY...showing ALL the COOL NEW PRODUCTS! We got a preview yesterday & I am sooooooooo excited. This is THE BEST RELEASE. There are TONS of WAY COOL products, with unlimited arting possibilities!! I can't wait to share WITH ALL OF YOU!!! So...come back...after the stores get the OFFICIAL word, we can spill the beans...It will be later TODAY...Link below!!! updated @ 10:45am. ***Here's the link*** you won't believe your eyes!!!!! Check it out. Over 100 NEW exciting products!!! Don't forget...study hard. The contest is coming! Now you'll need to study this catalog...there's a BLOG CONTEST coming. I'll give you a head start. The contest will involve selecting which artwork on the cover & inside the catalog is mine...pay attention...the prize will be REALLY good!! I'll be back with an update & a link to the catalog later! Thanks again for visiting and a final HAPPY BIRTHDAY to LISA!! I hope your day is THE BEST EVER! ps...check out Tim's blog, & if you are an animal lover...please donate! I did! Caroline & Deb are mean...they still won't let us show our CHA projects, so once again, I HAD to steal a photo for my blog friends. How cool is this??? It is a sheer sheet - a 12" x 12" sheet of sheer die cut in 6 patterns. They come in midnight black. BLACK!!!!!! YIPPEE!! Black co ordinates with everything!! Think of the possibilities!!!!!!!!!! I don't have this yet & it's killing me. Ok, gotta run...come back on Thursday & I'll have a photo of a little something I made with my favorite colors!! It's a promise! I had very good intentions...I thought I would make these Christmas cards for ALL my arty friends. WRONG!!! Only got 2 done... I WILL be better next year! Now on to the SHOPPING!! Check out Tim's blog for 3 new U-Tube demos. They are very cool. 3 products you'll NEED. Guaranteed! Hey...it's Tim's fault...NOT mine...blame him! NEWS flashes...Read all about it! Congrats to Linda Cain on having her book chosen to be displayed in the Maya Road booth @ CHA!!! YIPPEE!! Lucky Linda gets $75 worth of FREE Maya Road goodies as her prize. FREE a GOOD 4 letter word!! And...Linda will get a goodie or 2 from me too! There were 14 other entries chosen. Any other blog friends get a call from (my master)...Lisa Pace?? Let me know! I'll be happy to send you a goodie too! I call her my master because she is a Memory Makers Master 08! Talent to the max in that gal...amazing. You'll see her work in lots of scrapbook publications. I got several emails about the cool new metal flowers in the sneak peek...all wondering what I'll make with them. Guess what? I'm still wondering too! I haven't used them yet. I have to find just the right project. Yikes...I better hurry..I leave 2 weeks from today. I actually used PINK! And I used it twice yesterday on some CHA stuff. Never ever before have I used pink, but this idea NEEDED pink. Well...ok...I tried before, didn't like the results & trashed it. 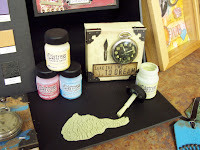 However, these dabber paints are perfect for chipboard & just the right color of pink. Shell pink & cloudy blue...way different for me, but fun stuff. I'll show you when I can. And...this is hard to believe...I did one whole BIG project with no vintage photo. HORRORS. Only colors...matter of fact, that's the title...COLORS. That's one of the photos that was chosen for the cover...I even used MARMALADE! Imagine that!! I hope your weekend is THE BEST EVER!! 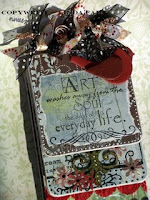 I hijacked ( a nicer word for stole) this from Caroline's blog to show my blog friends a few new Maya Road products. See the metal flower??? When those guys arrived I about fainted. OMG!!! They are PERFECT for all sorts of projects from cards to home decor items & layouts. And...FINALLY...mini alphabets. I've been dieing for them. Again...PERFECT for mini albums & cards. They are naked...so they can easily be painted, inked, papered or stamped. If you look closely, you'll also see a portion of the black die cut sheer sheet. I haven't seen this in person yet...but my little mind already has ideas. Same material as the sheer albums!! If you are @ CHA, come see these goodies and TONS more in booth 1987. I'd LOVE to meet ALL my blogging friends!! 900 visits...27 comments and ONE WINNER!! But first...Note that Shari Carroll made herself THE #1 specimen! HA! too funny! The story behind her offering is a story for another day...but VERY funny! Since the very first rubber stamp I ever bought was Hero Arts, I was thrilled to meet her. She is THE rubber stamping queen @ Hero & I'm the president of her fan club. Her stamping is to die for cool! I figured Tim would be easy for everyone to guess. With all the guesses of Robin, she sure knows now that she's a celebrity. Well this was fun. Next time the PRIZE will be something that I made & has been posted on the blog. Stay tuned..........you don't want to miss it! RACHEL GREIG!! YOU WIN!! There will a goodie box on the way to you!! Thanks for ALL the visits, my friends!!!!!!!!!!!!!! CHA -S 07 journal and a CONTEST!! You may have seen this before, but it's the best I can do for photos, until we can show some peeks. Anyway, there's a contest involved here..something to get the comments going again. In one week the blog had 1400 hits & not many comments. I like LOTS of comments!! When I'm happy, I give prizes...see how that works?? When I was invited to CHA I knew I wanted a place to keep things organized, because I would be out of control with excitement. This started out as a file folder and was put together with the Bind-It-All. The little envelope on the left held a pen and the small pocket on the top right held cards for autographs of famous folks. HINT! The pocket/page on the right was total fun. I had a CHA floor plan in that. And, the back cover. I have this journal displayed in my studio & on brain dead days, when arting isn't easy, I turn it to the back cover to give me a push. And I highlighted the vendors I didn't want to miss. Oh look!! There's MAYA ROAD! imagine that!! Now...contest details...I got autographs from 2 famous folks. Guess who they are & the winner will receive a FREE MAYA ROAD chipboard album. I'll check the comments on Monday morning. All my blog friends who have the correct combo will be tossed into a drawing & I'll announce the winner on Monday. Linda & Cecile can't play. They were there & were witnesses! Have a great weekend. I hope to get very inky! I leave 3 weeks from today for CHA!!! YIKES! !...TONS to do before then. Mr. Fed-Ex, the new man in my life, delivered a HUGE box of Maya Road goodies last night. I am NOT prejudice when I say...OMG!! I thought CHA-S microchips were to die for and they couldn't possible create anything better. WRONG!! Caroline & Deb have REALLY done some things that are even cooler than cool. One ITEM in particular about made me faint!!!!! I think THEY were made just for me!! I hope you're working on your Maya Road submissions. Not much time left!! I'd love to send a blogging friend a package!! Let me know if you win! Since I started using the flower business cards, I've had some really GREAT things happen. I think they're my lucky charm! A HUGE THANKS to Maya Road, Ranger and Stampers Anonymous. My idea last night was to create another style card using art parts from those 3 companies. This is the result. "With these hands" is by Stampers Anonymous. The scroll is a clear stamp from the Maya Road SCROLLS stamp tin & I'm sure everyone knows by now that faded jeans is made by Ranger. 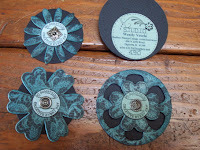 The base is a chipboard blossom coaster from Maya Road. Going to CHA??? YOU BET & I'm counting the days!! Come visit us in booth 1987...MAYA ROAD! You won't believe your eyes when you see the new goodies...I'm VERY impressed! Background paper for the photos?? I ONLY have one sheet & it's by Jenni Bowlin. God forbid...only ONE sheet...I can't cut into that beauty until I get more. I LOVE IT! 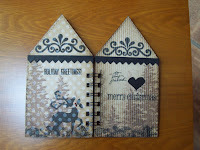 She also makes adorable packs of 4 x 4's that co-ordinate with the 12 x 12's, but are scaled down patterns. TO DIE FOR CUTE. I hoard them too. NUTS! The screen background stamp?? Sorry. It's an unmounted I got years ago & I have no clue who made it and that's probably why I left that one out of the last post. Don't forget about the consumer challenge sponsored by Maya Road. Details are in the posting from Saturday. Some gals have emailed me their submissions & I'm glad I'm not responsible to choose the winners. That will be a hard job. BUT...if any of my blog friends win...let me know & I'll send some Maya Road goodness from my personal stash and post your entry on the blog! I was asked to participate in a designers challenge for Ranger, with the art to be shown @ CHA next month. I'm one of 24...and THRILLED to be among some REALLY FAMOUS NAMES...More details when I can. Anyway, my piece is done, Fed-Exed & has arrived in New Jersey. Robin's comment was..."Exactly what we were looking for". YIPPEE! Sure made my day!! THANKS so much for the comments on my cards and actually ALL your comments. I'm off to get more done! Enjoy the day! Get your Maya Road submission done and emailed. How could you pass up FREE MAYA ROAD?? Then I got invited to CHA-S 07 & REALLY needed some new cards. I wanted something a little different, that wouldn't be easily tossed in the trash, so I made these with the chipboard blossoms 2 from Maya Road & broken china distress ink. I bet you're getting the picture here! So, with CHA -W 08 right around the corner, I needed new cards since all my others have been given away. We have another terribly cloudy day, so this isn't the best photo, but you can get the idea. These are made with Maya Road's motifs chipboard coasters, so they are pretty big. I used faded jeans this time...imagine that!! The large flower is from Autumn Leaves & the scroll on the back is made by Hero Arts. Do something creative everyday is a stamp from the Paper Source. The ribbon is also from Maya Road. So that's what I did today. Got 10 done & a few more started. Hope the rest of your Monday is great!! 1. Do you LOVE Maya Road?? 2. Do you want YOUR Art displayed in the Maya Road booth @ CHA W 2008 next month? 3. Do you want FREE Maya Road goodies? 5. But wait...there's more (Sound like an old RONCO commercial?) If any of MY BLOG friends are chosen, let me know...send me a scan & I'll post it on my blog &&&&& I'll give you some Maya Road goodness from my stash too!! Sounds exciting to me!! Happy arting!! How many favorites can a girl have?? Move over Faded Jeans...Here's my new favorite combo...Juniper paired with vintage photo. 2. To activate the dabber, press down (kind of hard) onto your craft sheet & squeeze @ the same time. This opens the valve & allows the paint to prime the dabber top. Once the flow starts, you're good to go. This sometimes takes 30 seconds or so. Be patient...some colors take longer than others. If it's a little hard to start, put just one squirt of water from the mini mister on your sheet. The water will help. Do not repeatedly slam it down on the craft sheet. This isn't enough time for the valve to open properly. 3. Dabbers are a no cleanup product. No brushes to wash out. Saves time ...for more arting. But, if needed, shake then remove the cap and it's ready to be used with a brush. 4. I wondered how scrapbookers got the cool looking dry brush paint look on their layouts. DUH...these guys are the perfect solution. Just swipe along the edges. VITAL info for the photo above. I'm learning...give as many details as possible! 1. 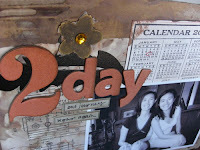 Cute chipboard scallop frame is from Maya Road. 2. Juniper paint dabber and vintage photo distress ink are from Ranger. 3. I LOVE this paper from K & Co.
Time to head to the studio. Have a GREAT day!! Happy dabbing!! Can't have a post without a photo. That would be boring. Here's the best I can do for today...sorry...no art! Top secret stuff!! We both love to visit antique malls & flea markets in the summer. One of the things I collect is cool printers blocks. So, I gathered these from my studio & I'm trying out my Christmas camera. I have got to get better @ this picture taking stuff VERY SOON. 1. The tiny LOVE YOUR LIFE stamp is from Hero Arts. It's a perfect fit for the medium size McGill tag punch. 2. Yes, the paper is Basic Grey's Periphery. I'm addicted. 3. The Dyson deal...regular price is $459. On SALE this week @ Target for $389. But wait, it gets better. Open a Target charge account & get 10% off your first day purchase. So, the out the door price was $374. I was quite proud of myself. And a little tip...save your $$$ for some new cool Maya Road products. We got some peeks yesterday. One word...WOW!!!!!!!! Can't wait 'til these goodies arrive on my doorstep. So...my word is "share". Saturday I shared my Ranger info @ a Distress Ink technique class. Today, I'm sharing my new toy with Rick. LOVE the DYSON...love the guy. But what I REALLY love is them working together!! Enjoy your Tuesday! I'll be arting! ps...maybe soon I'll be allowed to share some new Maya Road creations...made especially for CHA. WE HAD FUN!!! What a GREAT group of gals for my first Ranger Distress Ink Technique class on Saturday @ Scrapbook Friend'z in Bloomington, Illinois. You guys are THE BEST!!! I think the favorite technique of the day was...SPRITZ & FLICK... Imagine this...a room full of art chicks spritzing & flicking..sounded like applause to me, so that's when I took a bow! These gals were smart...they figured me out. Save the best for last! THANK YOU to ALL who attended both classes!!! And last but certainly not least...the RANGER company for an INK-redible experience. I learned TONS & got to pass it on! Each person chose their own papers, but we all used the bird, branches, scrolls, scallop ric rak and flowers from Maya Road. We crackled up a storm. Every box looked great and each was unique. GREAT JOB gals!!! This was a very fun class too. To answer some emails that I got...the Ranger apron was a gift to us @ Ranger U. I LOVE it...signed by Tim & Robin!! Sorry...I didn't take any photos in class...just too busy. I will try to remember that for the next classes. It would be fun to post the end results of the class. Ok, back to work. CHA is coming VERY soon & there's a TON of work (PLAY) to be done!! Thanks for reading this LONGGGGGGGGG post! All packed up & ready to roll!!!!! Dove CHOCOLATE...check...WHAT??? Hey...girls have to have energy to create!! Have a GREAT Saturday...I plan to & I'll do my best to make sure that the gals in both classes learn lots & have fun. ps...second class is really fun too. It combines Ranger & Maya Road...MY FAVORITES!! and the little Tag Art stamp is from Limited Edition. ALL inks are from...of course...Ranger. Bet you knew that! Time to scrub yesterdays ink from my fingers and get some fresh ink on again. Inky fingers make me happy! Remember...do something creative EVERY day! ps...if you've made some similiar tags, post a link in the comment section & show us. SHARING is good! Some lucky soul might even get a little gift from me! I tried to think of something witty for the new year, but it just didn't come. So here's my thought of the day, simple as it is. May your 2008 be THE BEST EVER!